I have, however, located three intelligence studies for Haiti. The first reference is a 200+ page government report, examining the cognitive impact of an ongoing US aid program, which provides food for children in Haitian schools (Cotten, 1985 ). The sampling is excellent: 1,034 students from 54 schools (p. 2). The average sample age is 10 (p. 26). 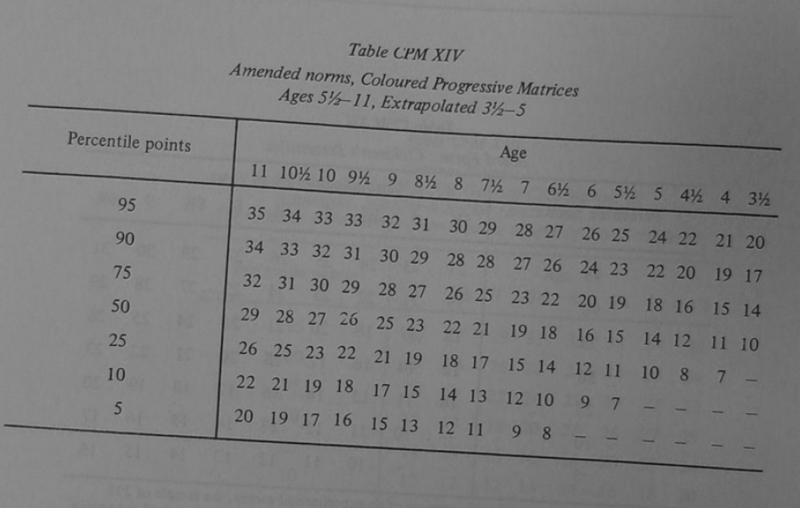 The ability test is the Raven’s Coloured Progressive Matrices; the scores are reported as the survey child’s raw score divided by the standardized age-level norm (p. 48). For 518 children participating in the feeding program, the reported score is 56 (Annex G). The average score for 10 year olds in the norm sample was 27, so this suggests a Raven score of 15 in the Haitian sample. This would correspond to an IQ score of 69. However, this test was also administered 16 years later than the UK comparison group. If IQ scores were now 5 points higher in the UK due to the Flynn Effect, then the scores in the Haitian group would actually correspond to an IQ of 64. Scores were only fractionally lower for the 515 children not participating in the feeding program (Annex G). So this study suggests an IQ of 64 for 1,033 Haitian school children in 1981. I will follow the methods of Wicherts et al. (2010) to rate the study quality. The sample was good (+), the test was administered correctly (+), there were no reported problems with the testing (+), and there were no suggestions of bias (+). However, the comparison norms may be problematic (-), as many children did not know their exact birth year (p. 25). This study also provides evidence for the practical relevance of IQ scores in Haiti (p. 75). There was a “highly significant” correlation between a composite measure of household wealth and Raven scores: .40 (p. 80). School quality measures such as attendance rates and tuition fees were also associated with student scores. The correlation between Raven and weight-for-height abnormalities associated with malnutrition was -.19 (p. 92). Demographic differences were also reported (p. 135). Male scores were fractionally higher than female scores. Private school children scored fractionally higher than public school children. The largest demographic IQ difference was between urban students and rural students (65 vs. 63). The second reference is a French language report from a Haitian research institute (de Ronceray & Petit-Frere, 1975 ). This study was performed at roughly the same time as the USAID study reported above and uses the same test (RCPM), however the results are anomalous and contradictory. 150 rural children, age 6, were selected from three towns in the Leogane region. Their parents were farmers who never attended school. The sample was divided into three groups based on school instructional language (French vs Creole vs flexible). Test data was collected in 1974 and reported for 133 children, yielding an average Raven score of 15 (p. 14). This corresponds to an IQ of 98. This IQ is implausible; so look through the study and let me know what you think. The third reference, a French language book chapter, describes an investigation into the school problems of 15 Haitian immigrants in Boston, Massachusetts (Douyon, 1982 ). The average age was 13, and the average stay in the US was 2 years. Only three of the children had parents with professional or semi-professional occupations. Children were tested with Wechsler intelligence scales and the Peabody Picture Vocabulary Test. Full-scale Wechsler IQ was 74 with a SD of 15.5. However, the PPVT yielded an IQ of 98 (SD 15.9). This small study is mostly irrelevant, however the author summarizes important data from yet another Haitian research report that may otherwise be very difficult to locate (bulletin no. 4 du Centre National d’Orientation Professionnelle, 1977). 961 children, ages 8-13, were selected from 8 schools in Port-au-Prince. They were tested with the RCPM and the Cattell Culture Fair Intelligence Test. The children exhibited an IQ of 55 on the Cattell test, and an IQ between 75-90 on the Raven test. A weighted average of the Cotten study and the de Ronceray study gives us an IQ of 68 for Haiti. More or less identical to the estimate currently used by Lynn. Click on the PDF icons to review these studies. Leave your comments or corrections below. Cotten, J. (1985). Evaluation Research on the PL 480 Title II School Feeding Program in Haiti. Port-au-Prince: USAID/Haiti. Douyon, C. (1982). Les problèmes scolaires de l’enfant haïtien à Boston. In C. Pierre-Jacques (Ed. ), Enfants de migrants haïtiens en Amérique du Nord (pp. 53-60). Centre de Recherches Caraïbes, Université de Montréal. de Ronceray, H., & Petit-Frere, S. (1975). Project experimentale sur le bilinguisme Creole-Francais au niveau de l’enseignement primaire en Haiti. Bulletin d’Informations du CHISS, 4, 2-25. Wicherts, J.M., Dolan, C.V., & van der Maas, H.L.J. (2010). A systematic literature review of the average IQ of sub-Saharan Africans. Intelligence, 38, 1-20.